Srinagar: – The Election Commission of India’s announcement that they are not going to hold Assembly election in the state of Jammu and Kashmir right now has left the regional parties fuming,l. However, the parties here have nevertheless started preparing for the Lok Sabha elections, scheduled to be held from April 11 in 7 phases. Almost all political parties barring Bharatiya Janata Party (BJP) has expressed their displeasure for not holding the state assembly elections simultaneously, however Political experts in Kashmir believe that the decision might help former Chief Minister Mehbooba Mufti in gaining the ground for the assembly elections. The ex-CM has been left with limited options ahead of coming elections and has now started to pick up different issues for her electoral gains. Sources said Mufti has asked for party carders to gear-up for Lok Sabha elections. There are 6 seats for Lok Sabha for the state: 3 from Kashmir valley, 2 from Jammu and 1 from Ladakh. In 2014, the PDP won all the 3 seats of Kashmir valley, while BJP won the 3 seats including one from Ladakh. Sources said except North Kashmir PDP is yet to announce candidates for rest of the state but has asked workers to reach out to masses and prepare for the upcoming election. With an eye on polls, Mufti has threatened to launch an agitation until the ban on Jamaat-i-Islami is not revoked. 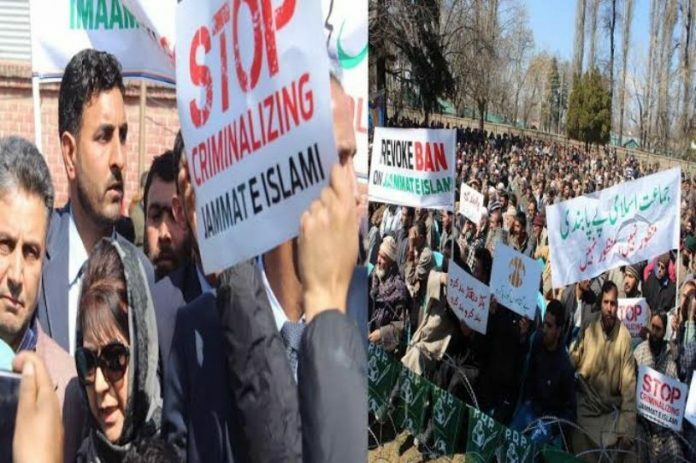 Last week, she led a massive protest rally in Anantnag district against the Centre’s ban on Jamaat-e-Islami (JeI) for allegedly having “close ties with militant outfits” and demanded revocation of the decision. Her Party workers also protested in many districts of the state. Ever since the centre decided to ban JeI, she has been speaking against the move, saying that the ban is an ‘Act of Vengeance’ by the Centre. However, experts in the Valley see this as a mere political gimmick to hoodwink the common masses of Kashmir ahead of upcoming elections. Prof. Noor Ahmad Baba, a political scientist at the Central University of Kashmir believes that the PDP is trying to rehabilitate her party because of the setbacks received during her tenure. Baba says Mufti wrongly believes that Jamaat followers might vote for her in the upcoming elections and she is trying to impress them. “But this time that maybe not the case keeping in view of the situation that PDP has created in last 4 years,” Baba says. Noted political analyst Sheikh Showkat Hussain says that Mehbooba Mufti is trying to stay relevant as she has lost ground in the Valley. He doesn’t believe that this might help her. According to sources, Jamaat has a cadre base of around 6,000 members in the state. It also runs a network of schools, orphanages, relief organisations and other social institutions. It is believed that Jamaat carders helped People’s Democratic Party in 2002 Assembly elections- allegations that are denied by Jamaat leaders from time to time. However, sources in Jammat privacy to TwoCircles.net said some supporters of Jamaat helped the PDP led by Mufti Mohammad Sayeed to power. However, this step was taken to defeat the National Conference (NC) whom Jamaat had opposed from the beginning. “When we look into History, Jamaat has suffered huge damage..its members were targeted by both Govt. and its militia knows as Ikhwan. Houses were burned; members were killed, tortured and disappeared for just being with Jamaat. Most of the damage was done when National Conference was in power, so in order to get some relief, we pushed Mufti Sayeed to power and it was a mutual understanding,” said a cadre of Jamaat-i-Islami who wished to remain anonymous due to security reasons. He further says it didn’t help them and they realise that they are no different from other mainstream parties. 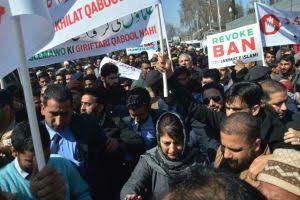 “And if you see presently how Mehbooba is protesting against Jamaat ban… she thinks that she might get sympathy from our carders but that will not be the case,” he adds. Er. Rasheed, a firebrand politician and an independent legislator from North Kashmir, says that she has lost credibility and thus beating drums in the Valley for electoral purposes. “Why doesn’t she take all the regional parties on board and meet Prime Minister Modi for revocation of the ban, if she means business? She is doing this to gain the lost ground,” he said. PDP spokesperson Najmu Saqib argued that protesting against Jamaat ban has nothing to do with upcoming elections and that opposition is creating a false narrative which is not based on facts. “It was during the National Conference’s rule that Jamaat members were beaten, arrested and forced to migrate. NC workers burned houses of hundreds of workers, they would be without electricity, roads and other basic faculties and when Mufti sahib came into power… they were living a dignified life,” Saqib says.